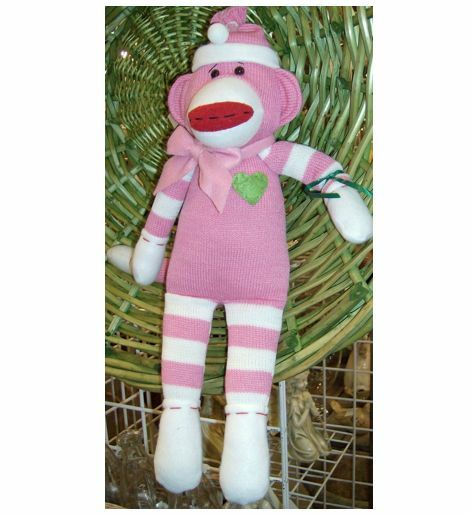 Home > Sale > Sock Monkey Doll - Addie 18"
Addie s a super cute pink plush sock monkey. Addie is a pretty shade of pink and is wearing a pink hat trimmed in white and a pom pom on top. She has pink and white arms and legs. She has a pink bow around her neck and a green felt heart. This adorable 18 inch Sock Monkey will steal your heart. The arms on this Monkey are hot-glued on so this plush is best suited for decoration, or adults and not small children.